First, let me say that I love reading Barbara Kingsolver. I really do. I'm going to save my rant about my adoration of her writing for the review of this book. But just know that I really enjoy her writing. Okay, back to the beginning. I like it, especially the third sentence. Sure, she's simply describing nature, both human and non-human, but it's how she describes these things. Her descriptions of Appalachian life are wonderful and the book is filled with them. I'm enjoying it. Last, I leave you with a picture. It's the first thing you see when you open the book. 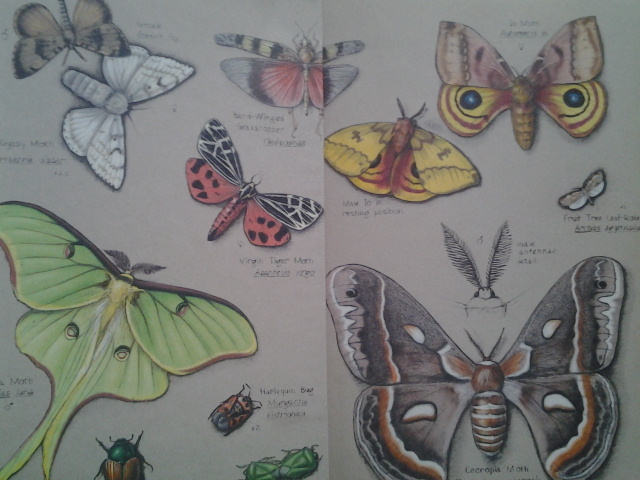 I don't really like bugs that much in person, but I like these illustrations. Yeah, she's great. Thanks for stopping by. I have never read Barbara Kingsolver, but I agree about the beauty of the language here. Sounds like I must add her to my reading list. Most definitely add to reading list; The Lacuna, The Bean Trees...its all good. Thanks for stopping by. It's a thought-provoking opening, for sure. I thought so too. Thanks for stopping by. That is a beautiful beginning. I really like the language. Agreed. Have a good weekend. I'm glad you've discovered Kingsolver. She's fantastic. She writes about love and making connections within/around the world in a very beautiful, non-cheesy way. Yes, that is a really lovely beginning. I wonder who she is and what will be her connection with the natural world. Let's just say she has a very strong connection with the natural world -- related to occupation and place of residence...I don't think that's giving too much away. I enjoyed this book of hers in particular. Very good. And she inspired me to eat goat, which I hadn't really done before. It's good to hear that someone else has read this book and enjoyed it too...I don't think B. Kingsolver can convince me to eat goat though, haha.